As a general rule, disregard the directions about timing on seed packets. They’re usually written for the Midwest, the Pacific Northwest, the South, the East Coast, etc. They’re written for almost everyone but us in Southern California. We’re different. Here in the middle of the fall season is onion-sowing time in Southern California. Checking my notes from some past years, I sowed good onion crops on October 12, on October 17, on October 23, and even as late as November 15 one year. Whenever I had sown earlier or later than that, my onion bulbs didn’t turned out as well. So, I’d estimate that mid-October through mid-November is the sweet spot for sowing onions in Southern California. A mnemonic might be to think of sowing onions near Halloween. 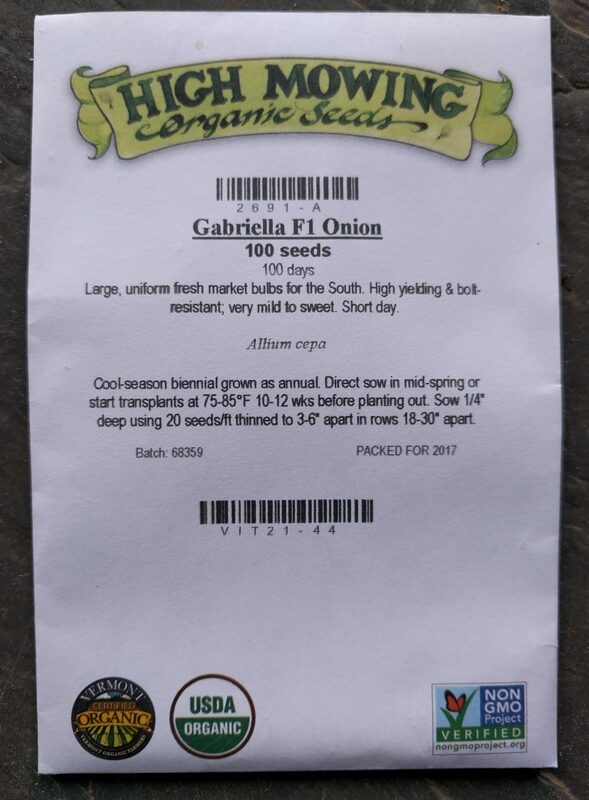 By the way, if you’re buying and transplanting seedlings instead of sowing onion seeds you can just do it a month or two after Halloween. 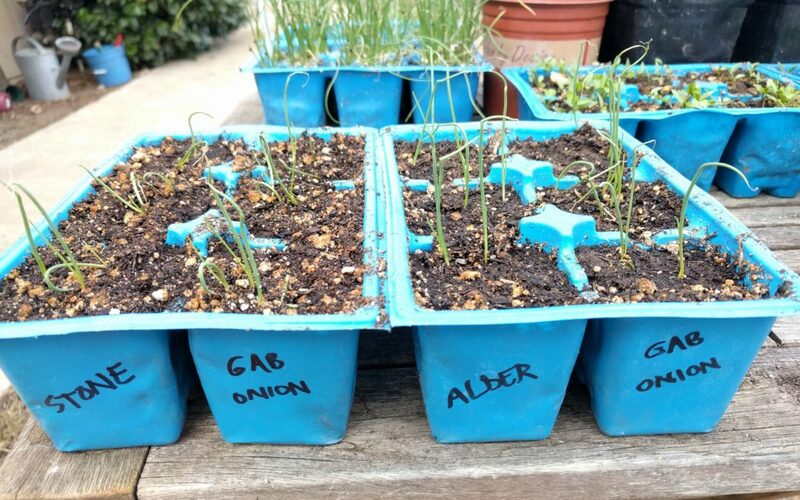 For example, I’ve successfully planted onion seedlings from early December into January. Why is it that these dates work well? 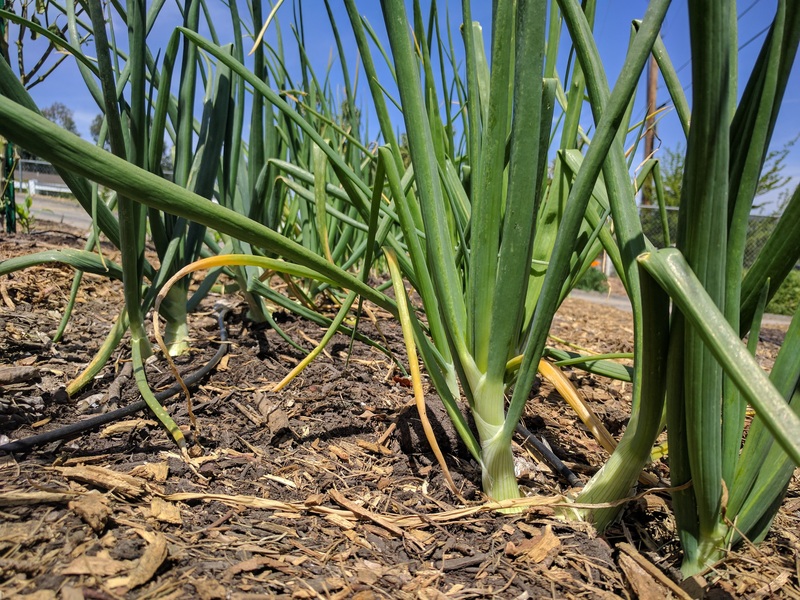 What happens is that onions start growing during the mild fall weather — they look like little blades of grass at first (see the photo at the top) — and then they go through winter slowly getting big, spiky tops which look like punk-rock mohawks. Come spring, just above the dirt, the bulbs form. They’re basically a bunch of fattened onion leaves that are, instead of green, a white or yellow or red color, depending on the variety. Soon the green tops start dying off; they dry and become yellowish and kink at the top of the bulb and topple over. That’s how the life of an onion plant is supposed to proceed. 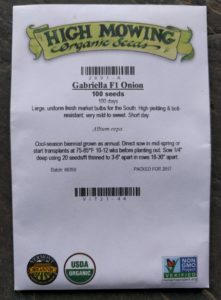 But if you sow onions at the wrong time — in the spring as seed packets often suggest, for example — they’ll grow just fine at first, yes, but they won’t make the big bulbs you’re hoping for, if they make bulbs at all. I know this from firsthand experience, unfortunately. I’ve tried a lot of varieties over the years, but my favorites today are Yellow Granex and Gabriella. My wife and I both love the taste of these sweet, yellow onions, and they reliably grow well for me year after year. I get my seeds of Yellow Granex from Botanical Interests, and my seeds of Gabriella from High Mowing. When I say “onions” I mean bulb onions, by the way, not green onions, scallions, or chives. Those are related but different. They’ll never form a large bulb, no matter when you plant them or for how long they grow. Onions can grow surprisingly close to one another. Just picture how big you want the bulbs to get and then space the plants accordingly, if you’re planting in a row. 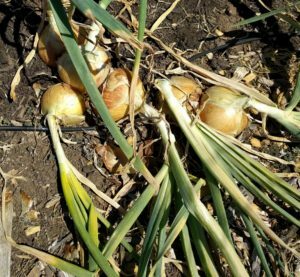 Last year, however, I arranged some of my onions in clumps of three or four plants instead of in rows (notice that in the photos above?). I got the idea from Charles Dowding, and it worked great. As the bulbs formed, each plant migrated away from the others. 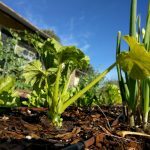 The method used my garden bed space very efficiently, and it also meant that I had to spend less time lining up tiny single onion plants in a row during transplanting. I’ll be planting in clumps again this year, exclusively. I stop watering my onions in mid or late April. 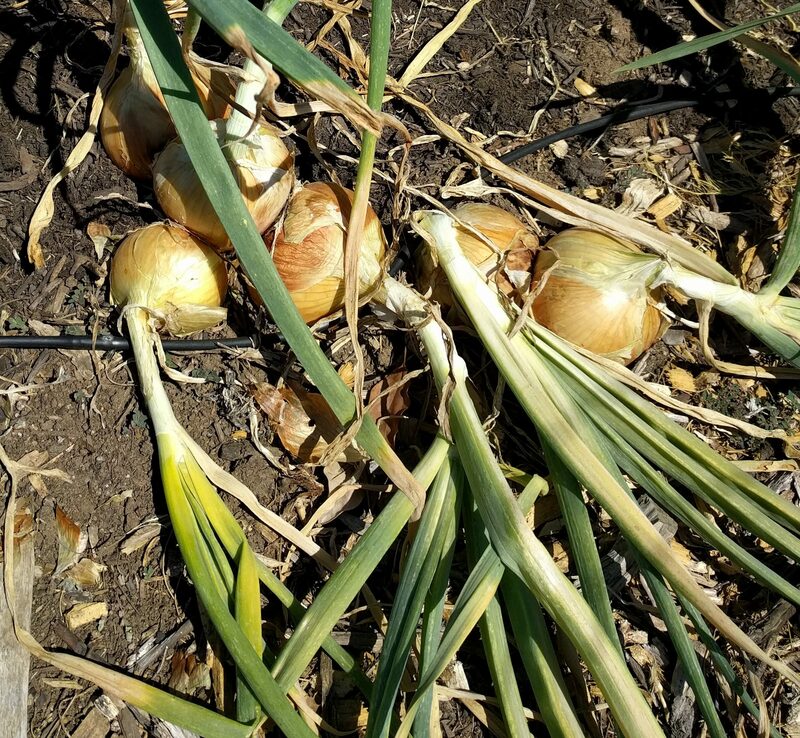 They’re not ready to harvest yet, but their bulbs are enlarging and there’s enough residual moisture in the soil for the plants to finish their growth. Come May, at harvest time, they’re easy to twist out of the dirt as the bulb and the dirt are both dry. We ate our last onion last week (mid-October). 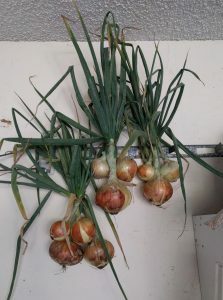 Having harvested our first onions in May, that means we had enough from the garden and were able to store them well enough for five months of eating onions every day. Even if I grew more onions, we would still stop eating them around now. The challenge isn’t quantity, it’s storage quality. 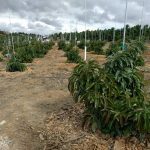 Without a specific storage facility where temperature and humidity and airflow are kept at ideal levels, as commercial farmers use, onions will only keep for so long. Hang the onions somewhere in the garage. That’s so they have plenty of air circulating around them. They’ll mold and rot faster if there’s not airflow. I kept them in milk crates one year and they didn’t last long. And make sure they’re in a cool, shady area. Airflow, cool, and dry. Those are the characteristics of the environment you’re trying to create. One last thing: sometimes, instead of the tops falling over, onion plants shoot up a flower stalk. It’s pretty, but it’s not good for the quality of the bulb. All’s not lost though. The bulb is still perfectly edible, only it will have a woody, hollow core. Eat bulbs that sent up a flower stalk before you eat the perfect bulbs, for the perfect bulbs store longer. Awesome!! I will have great onions this year!! Thanks for all of your observations! Great summary points Greg thank you very much for taking the time to summarize the growing and harvesting of onions. We successfully grew seedling onions in containers this past year however I grew them 6 inches apart which produced very large red and white onions. this next season I’ll try the cluster approach which I think is a better way when growing in a container. thank you for that idea. 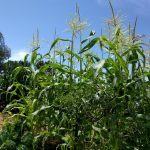 one thing you did not mention, and that’s why I’m writing, we noticed a remarkable difference between the taste of what we grew and the taste of what was available at the grocery store. Our onions were noticeably sweeter and truly provided a pure onion taste, with no unwanted after taste. our taste test came about by accident because we had forgotten about one barrel of onions both red and white and because we thought we were out of homegrown onions we bought onions at a grocery store. 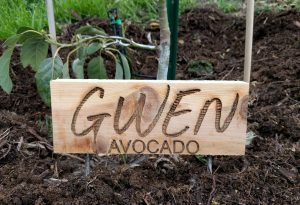 We’ll soon be planting seedlings again. Thanks for the comments, Jock. 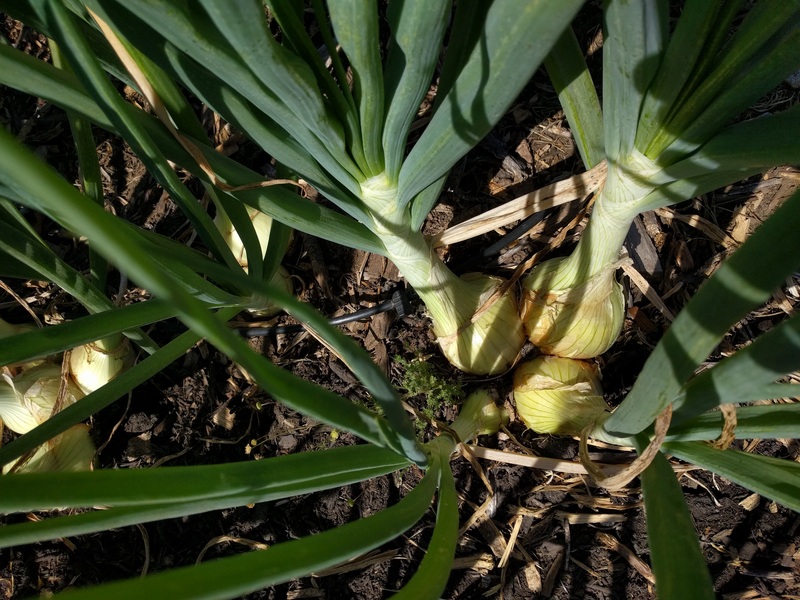 If you plant in clusters this year, just be aware that some of the onions won’t be perfectly spherical; some have a small flat spot on the side where they’re abutting another onion. I don’t care about that, but I imagine some people might. Yeah, some people might think that onions are cheap and uniform, and so you might as well buy them at the grocery store. Not so. Good point. Look forward to seeing the Hass-Carmen. What a fantastic website. Great information! 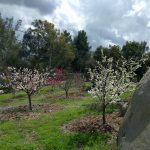 Have you ever noticed a higher percentage of onions plants flowering when you grow them from seedlings instead of from seeds? Thanks so much, Shawn. I can’t say I have a great answer to that question because I’ve never done a rigorous comparison. Last year, for example, the onions I grew from seed didn’t flower at all, not a single one. But the onions I grew from seedlings that I bought from the nursery flowered a bit. Problem is, they were all different varieties. On top of that, I planted the seedlings from the nursery about two weeks before I transplanted the seedlings that I grew from seed. Can’t make any real conclusions from all of that. I suspect that if the varieties and the timing of planting are the same, there shouldn’t be much of a difference in bolting. Just curious if your onions this year are experiencing a higher then normal amount of bolting? This year my crop has been the worst ever. Seems to lend credence to the theory that changes in weather is a contributing factor. Thoughts? That’s really interesting. Mine haven’t shown any bolting yet. Zero. This is strange because I’ve always had at least a few in the past. But this year I planted later than I ever have (planted seedlings on January 1 and 16). Maybe I unwittingly planted at a good time for the unusually warm then chilly winter we had whereas in a normal year I would’ve had a lot of bolting. Then again there is still time for mine to bolt. how can you tell when the seedlings are ready to transplant? thanks, great stuff! Onion seedlings can be transplanted anytime, technically. You just have to be extra gentle with small seedlings because they’re more fragile. But I usually transplant mine once each plant has two or more leaf blades. At that point, they are at least as tall as one of your fingers. So I transplanted my onions as you said (thanks for getting back to me!) and they are fine, but the tiny bulbs at the bottom are sitting just above the soil line. Another gardener said I have to keep the bulbs covered with soil. What should I do? 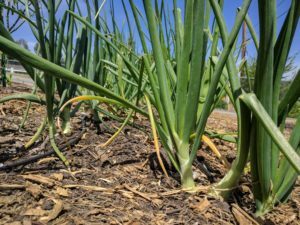 Onion bulbs don’t need to be covered by soil, unlike carrots or beets. The bulbs are just enlarged leaves actually.